"Dum servant oves invenerunt Agnum Dei." — Jerome. Source: Horatius Bonar, Hymns of Faith and Hope, First Series, 1857, pp. 240-245. "Peace has come to earth again." "God to man is drawing near." Succourer of earth's great need. This the light of Jacob's star! David's Lord, and David's Son. Babe of promise, born at last. When our hopes were overcast. Is to be achieved by thee? Of this world shall bend to thee? And all earth shall pay the vow? As belongs to David's Son? As belongs to Jesse's line? Art thou the Eternal One? Art thou very Son of God? Our best off'ring to thee bring. Thus we own thee, Lamb of God. Heaven and earth shall hear its fame. Judah's Lion, Lamb of God! Claim, and wear the radiant gem. End the sorrows of our night. Speak the word, and all is bright. Dwell within her holy halls. Bridegroom of the Church, arise. Cleanse it from each curse and stain. And the long night end in day. Bonar gives us his translation of the line from Jerome "Dum servant oves, invenerunt Agnum Dei" in his The Land of Promise at p. 113: "While feeding their sheep, they found the Lamb of God." This same essay is also found in Bonar's Days and nights in the East; or, Illustrations of Bible Scenes (1866). Bonar places the same quotation from Jerome over another of his hymns, What The Shepherds Found. As a side note, Bonar had been touring the Holy Land, and taking notes as he went. This hymn, "The Shepherds' Plain," reflect his feelings on visiting the plain where shepherds were keeping their sheep on the night when The Messenger of God announced the Good News! Down the steep slope we went, on through a ploughed field to the Shepherd's Plain. In the middle of it are the ruins of a convent or church, surrounded by trees, chiefly olives. As this is the only plain in the neighbourhood, the district being very hilly, there is little doubt that this is the real plain where the shepherds fed their flocks when the angel appeared. They were " abiding in the field, keeping watch over their flock by night" (Luke ii. 8), most likely in spring or summer, not in winter. To these believing men, lying on this green plain, the message came, concerning the wondrous birth. " While feeding their sheep, they found the Lamb of God" as Jerome remarks. Honorius Bonar, The Land of Promise: Notes of a Spring-Journey (London: James Nisbet & Co,, 1858), pp. 112-113. Blessed night, when first that plain. H. Bonar. [Christmas.] Published in his Hymns of Faith & Hope. 1st series, 1857, in 34 stanzas of 3 1ines, and headed "The Shepherds' Plain." In the Irish Church Hymnal, 1873, two centos are given from this poem, (1) "Blessed night, when first that plain," and (2) "Mighty King of Righteousness "; and in Mrs. Brock's Children's Hymn Book, 1881, No. 72, a cento is given as "Blessed Night, When Bethlehem's Plain," with "Alleluia" as a refrain. No. 73, in the same Collection and in the same metre, "Hark, what music fills the sky," is attributed to Dr. Bonar in error. It forms a good companion hymn to "Blessed night, when first that plain." The hymn "Hark, what music fills the sky" was written by Miss E. (Esther) Wiglesworth (1827-1907). These two hymns have been arranged as a medley; see: Blessed Night, When First That-Medley. 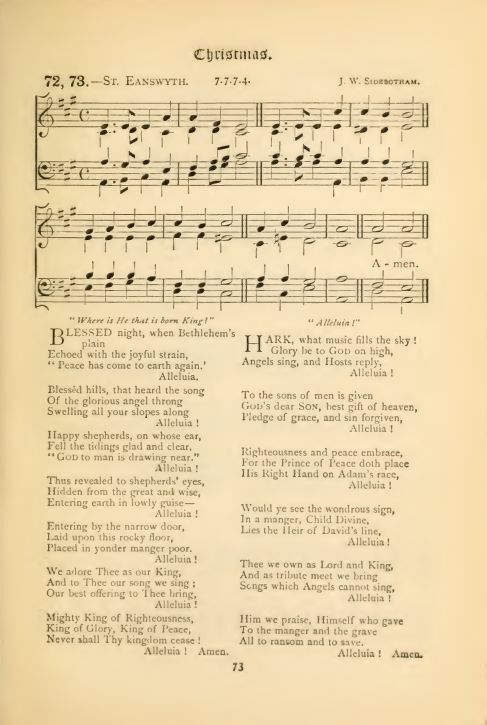 Sheet music "St. Eanswyth" by J. W. Sidebotham from Children's Hymn Book (New York: E. P. Dutton, 1881), #72, p. 73. Claim and wear the radiant gem. 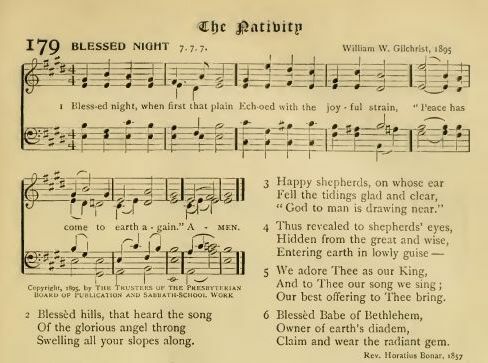 Sheet Music "Blessed Night" by William W. Gilchrist, 1895. From The Hymnal Published by Authority of The General Assembly of the Presbyterian Church in the United States of America (Philadelphia: The Presbyterian Board of Publication and Sabbath-School Work, 1895), #79.